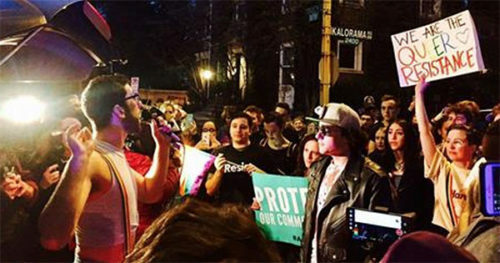 The exclusive Washington, D.C. neighborhood of Kalorama — home to the Obamas, Rex Tillerson and, yes, Ivanka Trump and her husband Jared Kushner — was the scene of the latest dance party protest. Just three months after crowds got jiggy with it near the home of Vice President Mike Pence, the WERK for Peace group organized Saturday’s march and dance party outside the Kushner’s residence. Ivanka and her hubby reportedly were not at home, having traveled to New York for their youngest son’s birthday, says New York Magazine. And let it be known, not everybody dancing was queer. Thank you, allies! But the hit of the party looked as if the night paired perfectly with white wine and a mink coat. New York identified her as Dianne Bruce — who lives across the street from Ivanka and Jared, and watched the whole thing from her front steps while wearing a serene smile.